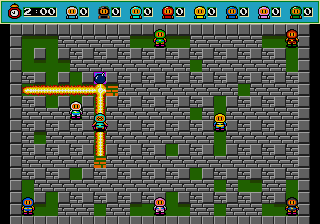 PREMISE:          This is the original Bomberman game for the Genesis. copyright on the Bomberman franchise. this wouldve ben a blast if an 8 player option had been added to mega bomberman! 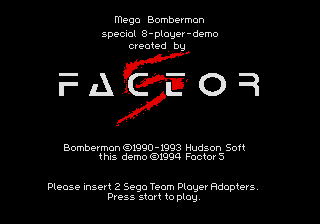 well anyway, this demo is in its very early stages, but still fun (Gens is the only emulator I know that runs it flawlessly) well if you have the capabality to burn this onto an eprom, them try it and get some friends over and play, or netplay with gens! This game is the bomb! I need to find some 4 player adapters now!